Children age 2 and older must have a ticket to enter the arena. Children under 2 years of age do not need a ticket, but must sit on the accompanying adult's lap. I received a certificate for Griffins tickets. How do I redeem it? You need to bring your certificate to The Zone (located on the west side of Van Andel Arena) and exchange it for your seats. Only originals will be accepted, and we suggest you redeem the certificate at least one week in advance of your desired game. The Zone is open Monday-Friday 10-6 p.m. and Saturday 10 a.m.-2 p.m. during the hockey season. What are your ticket and bag policies? Click here to view our ticket policies. Bags must be 14 inches by 14 inches by 6 inches or smaller, and while backpacks are not permitted, diaper bags and medical bags can be brought. All bags, regardless of size, will be searched. What is a Griffins Group Outing? A Griffins group outing is twenty or more people looking to experience an exciting and memorable Griffins game together. Griffins groups are made up of all kinds of people including: families, friends, businesses, community organizations, employee groups, holiday parties, alumni associations, sports teams and youth groups. Click here for the Groups Tickets page. Are groups eligible to receive a special ticket price? Yes. Your group can save up to $6 off the box office price plus zero service fees. Your savings per ticket is dependant upon the size of your group. Are giveaway items and/or FREE food offers part of a Griffins group outing? Yes. Select nights offer FREE $5 concession vouchers, dollar concession specials and premium giveaway items. 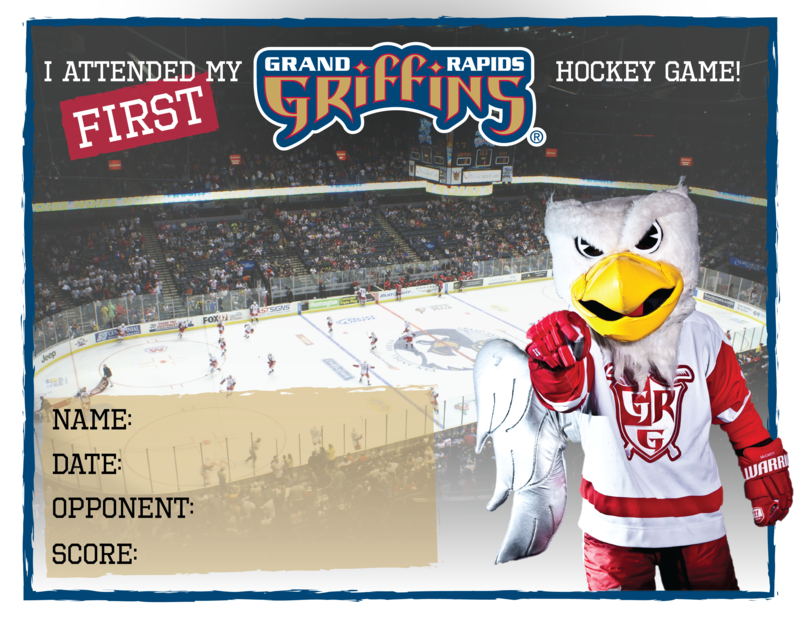 What else do we receive as part of a Griffins group outing package? Standard features include a video board welcome, Griffins group raffle (one winner per group) and a group leader disposable camera. Zamboni rides may also be booked through a group outing. Are certain games dedicated to specific groups? Yes. We annually host theme nights for groups like scouts, schools, churches and youth hockey associations. We annually host a weekday matinee game, with over 5,000 students from all over West Michigan in attendance. Is a birthday party considered a group? Yes. Ten or more people make up a Griffins birthday party; complete with a video board annoucement plus an in-seat visit from either Griff or Finn. Click here for more info. What else should we know about Griffins group outings? Group outings can raise thousands of dollars through fundraising programs like the Throw for Dough and national anthem performances. Youth hockey teams can play at the Van Andel Arena prior to a Griffins' Saturday games, or during an intermission. Businesses looking to entertain clients can rent one of four exclusive Griffins hospitality areas. How do I reserve and purchase tickets for my Griffins groups outings? 2) Your personal account executive will walk you through the process of selecting a game date and reserving tickets for your group. We will even offer tools to help you promote your event. 3) A deadline date will be set, providing you time to collect ticket totals and payment. Payments can be made over the phone or in person at the Griffins office. How do I ride the Zamboni? If you are interested in riding the Zamboni, please call the team office at (616) 774-4585, or keep an eye out for contests on the Griffins' Facebook and Twitter pages. A creature from Greek mythology that possesses the head and wings of an eagle and the body of a lion. The Griffins' nickname was adopted on Nov. 20, 1995. Can I bring my camera or video camera to a Griffins game? Guests are welcome to bring cameras into Van Andel Arena for Griffins games for personal/non-commercial use, providing they conform to the following regulations. Still cameras must not have a lens that extends over 80 mm or a detachable lens over 80 mm. Pocket-sized video recording devices, such as cell phones, digital cameras and flip cams, are permitted. Anyone wishing to use a still camera with a lens larger than 80 mm or wishing to record video with a camcorder or larger video camera must request and be approved for a credential by the Griffins public relations department. Guests must not stand in the aisles or obstruct the view of others while taking pictures or video, and tripods, monopods and other camera support pods are not permitted. Flash photography and the use of lights on video recording devices are prohibited. The Griffins reserve the right to remove any guests who do not cooperate with this policy. My organization is having a fundraiser. Would the Griffins be willing to donate anything? In order to request a donation, please mail of fax a letter of request to the Griffins with "Attn: Donation Request" on the letterhead of the organization holding the fundraiser. Please include in the letter all pertinent details regarding the event (date/time, what the event will benefit, tax ID number if applicable, etc...). Please note that the Griffins receive many requests for donations, so not all requests can be fulfilled. Could you send me a pocket/magnet schedule or other team memorabilia? Requests for magnet schedules and other team memorabilia cannot be fulfilled, as these items are either used for promotional giveaways or are sold at The Zone. Pocket schedule requests made by phone or email without an accompanying SASE will not be fulfilled. How can I arrange for Griff or Finn to visit my seats during the game? You must have tickets to the game before you can arrange for a Griff or Finn visit. Please call (616) 774-4585 ext. 3024 with your seat location to arrange the visit at least two weeks prior to the game. A $25 donation to the Griffins Youth Foundation is required. How can I sing the national anthem(s) at a Griffins game? Recordings may also be submitted be emailing an mp3 file to griff@griffinshockey.com with the subject line: National Anthem. Be sure to include your name, address, phone number and email address with the recording. How do I get my birthday/anniversary announced at a Griffins game? To request to have your birthday or anniversary announced at a Griffins game, please click here and fill in the requested information. Do the Griffins hold tryouts for players? No. Training camp spots are by invitation only.